Here's How Much Data The 'Anonymous' Hacker Attack Exposed : The Two-Way A security firm sifting through the stolen data said it found 50,000 credit card numbers, 27,000 phone numbers and 44,000 passwords. 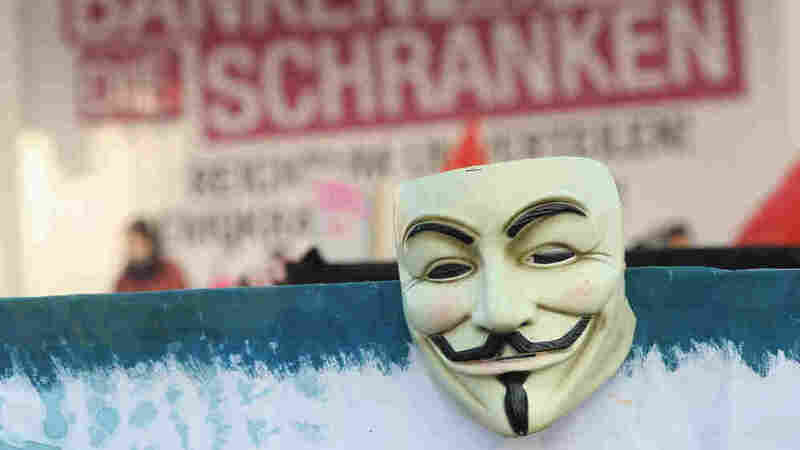 The Guy Fawkes mask has come to symbolize the group Anonymous. This mask was seen during protest in Germany. -- "50,277 Unique Credit Card Numbers, of which 9,651 are NOT expired." -- "86,594 Email addresses, of which 47,680 are unique." -- "27,537 Phone Numbers, of which 25,680 are unique." -- "44,188 Encrypted Passwords, of which roughly 50% could be easily cracked. 73.7% of decrypted passwords were weak"
-- "13,973 of the addresses belonged to United States victims; the remainder belonged to individuals from around the world." The firm points out that these were data for Stratfor customers whose names started with the letters A through M. The rest of data are expected to be released in the future. As All Things D details, Stratfor has promised to inform customers whose data has been compromised by tomorrow and Anonymous is at once "seeking to justify its actions" and distance themselves from the hacking. "Wired reported that someone who participated in the attack said that a total of four servers were breached, and the data on them wiped. The question that then logically arises is this: What was a firm that's ostensibly in the business of advising business and government clients on security doing about its own?" For the record, in a statement on its Facebook page, Stratfor said yesterday that Anonymous was not able to break into servers with its client information. "The disclosure was merely a list of some of the members that have purchased our publications and does not comprise a list of individuals or entities that have a relationship with Stratfor beyond their purchase of our subscription-based publications," the statement said. Stratfor also advised its clients to keep quiet to avoid retaliation from the hackers.